Fairfax County residents will be thrilled to learn that the Occoquan Regional Park is set to receive a new and refurbished waterfront over the next two years. The new addition comes as a dedication to, and a memorial for Jean R. Packard, the first woman chairman of the Fairfax County Board of Supervisors from 1972 to 1975, who recently passed away on October 15, 2014. Mrs. Packard had her fingerprints etched into the community for over four decades, helping preserve community parks and serving for a term of 24 years at Northern Virginia’s Regional Park Authority. In her remembrance, the new Jean R. Packard Occoquan Center at Occoquan Regional Park will serve to educate visitors about the history of Occoquan. Funded by Fairfax County, they will be opening a “1608 Room”, which will center around John Smith’s expedition up the Potomac from the Jamestown colony. This room will offer spectacular views of the river, and be available to be booked for different types of functions, making it an attractive site for social gatherings. 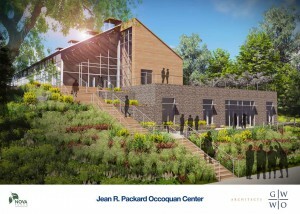 For more information on Jean R. Packard and the new center being built at Occoquan Regional Park, head over to The Connection Newspapers’ website here.